For more than 17 years, we have been developing and promoting our partners' business on the Internet. "Inform-S" - is first in all the staff, quality services and individual and personal approach to each partner, with strong operating principles we have established during this period. Among our 100 employees we have, experienced SEO professionals, the best and talented designers, efficient online marketers and analysts. Team "C-Inform" - the most important resource of the company is our ambitious, young, creative staff, each of us has full identity and is a true professional!, "Inform-S" is not just a company, but a way of thinking, and even a way of life. Every employee of the company "Inform-S" is trying to do more than what the customer expects from him. 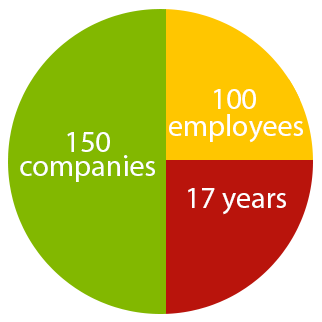 More than 150 companies rely on the technical support of our specialists. In addition to our services for website development (creation) of dynamic websites and their promotion, the company "Inform-S" is ready to conduct usability analysis of the site to attract visitors from social networking, and for your company's advertising in Yandex, we do a triple stage audit of your sales and increase conversion. We are perfectionists and professionals, so our customers have everything done efficiently and precisely at the stipulated time, because we know that the delay for one day is considered to be late, as a model KPI is classifies are sloppiness. Employees of "Inform-S" go through all the features of the business processes of our customers, because we care about our business partner and the results of our services. We are absolutely clear that communication with each of the employees "Inform-S" - is communication with the company as a whole, so we are extremely polite, courteous and helpful in all our matters. Your dedicated manager is primarily an experienced internet marketer, whose job includes coordination of business analysts, programmers, designers, and with the SEO Specialist for the development of your site. With the work of each project team aims to increase the profitability of your business online. Being Result oriented, with clarity and efficiency of tasks, business humor, positive attitude to life and work, pleasure, mutual assistance to each other, solidarity, friendliness, team spirit - are the main part of our principles. We really want to make this world better. Therefore, "Inform-S" seeks not only to help the business of our partners, but also to give their employees an interesting and useful work experience that will give them the opportunity to enjoy their achievement and the ability to be secure and confident individuals. We gathered in our team all the best talent in the market and are ready to give them to you today!